GBPUSD: The pair saw price weakness on Friday and now looks to follow through lower in the days ahead. Support lies at the 1.4050 level where a break will turn attention to the 1.4000 level. Further down, support lies at the 1.3950 level. Below here will set the stage for more weakness towards the 1.3900 level. Conversely, resistance stands at the 1.4150 levels with a turn above here allowing more strength to build up towards the 1.4200 level. 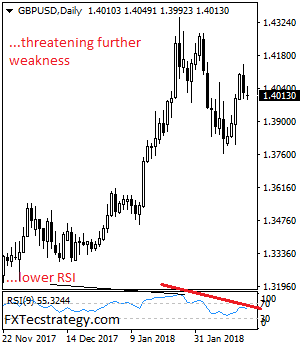 Further out, resistance resides at the 1.4250 level followed by the 1.4300 level. On the whole, GBPUSD looks to correct lower. This report is prepared solely for information and data purposes. Opinions, estimates and projections contained herein are those of FXTechstrategy.com own as of the date hereof and are subject to change without notice. The information and opinions contained herein have been compiled or arrived at from sources believed to be reliable but no representation or warranty, express or implied, is made as to their accuracy or completeness and neither the information nor the forecast shall be taken as a representation for which FXTechstrategy.com incurs any responsibility. FXTstrategy.com does not accept any liability whatsoever for any loss arising from any use of this report or its contents. This report is not construed as an offer to sell or solicitation of any offer to buy any of the currencies referred to in this report.